Junius Courtney established a number of sophisticated jazz combos in the East Bay, after arriving from New Orleans in 1945. 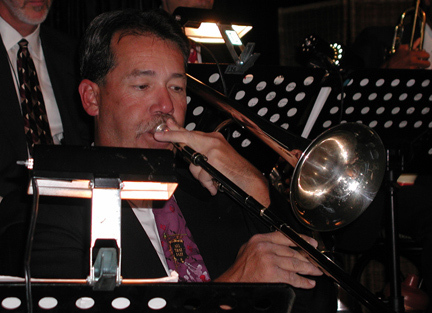 He founded his big band in 1962, and the current members are dedicated to keeping the music alive. Junius passed at age 85, two weeks after presiding over the band onstage before an audience of 3000 at the KCSM “Jazz on the Hill” Festival. George Spencer then stepped up to the musical director duties. With large shoes to fill, “Jazzbeaux” relies on the sweetness of his trumpet tone, dedication to the family of musicians, and elegant musicianship. Nat Courtney leads the band from behind the drumkit, as part of his lifelong commitment to music. He started playing at age 12 with the plan of holding the rhythm together for his father. His beat goes on, and it’s swingin’. Band leader Nat Courtney’s commitment to a life in music began at age 12 when he took up the drums with a plan to accompany his father. He was quickly substituting for Junius Courtney’s regular drummer, and soon took over the drum chair permanently. Nat Courtney’s commitment to jazz and his relaxed professionalism parallel his commitment to his own family, his extended musical family and to progressive work in the community. He augments his dead-on percussion and swinging leadership at the drumkit with occasional vocals (“Skylark”) and duets with Denise Perrier - an ebullient “Come Fly With Me” that they bat out of the park. 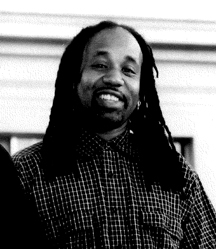 Musical Director George “Jazzbeaux” Spencer is a multi-instrumentalist and educator. 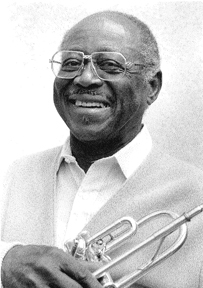 Spencer played with John Handy and Johnny Otis, was music director and road manager for Esther Phillips, and performed with the Manhattans, Martha Reeves, Dakota Staton and a host of others. He has directed choirs and taught at Laney and Merritt Colleges, the University of Santa Clara, UCB Summer Music Program, S.F. State University, and other area institutions. He teaches music for the Emery School System, where he has kept the music program alive and funded while mentoring the next jazz generation. His trumpet work and musical direction of the Junius Courtney Big Band show Spencer to be a consummate musician. From his youth in Detroit to his career in the Bay Area and performances at international jazz festivals like Umbria, music is central to Jazzbeaux. Vocalist Denise Perrier is an internationally-acclaimed performer and recording artist. Having moved from Louisiana to Oakland as a young girl, she was scouted by Louis Armstrong as a young adult. Her group, “The Intervals,” was included in Armstrong’s entourage and taken to Las Vegas. Perrier’s singing career has mixed soulful material and international venues since then. Australia, the Philippines, Taiwan, Formosa, Japan, Guam, Vietnam, Hong Kong, European cities, and then New York and San Francisco have been her ports of call. Over the past years, Perrier has toured extensively in Russia. Her latest recordings include “East Meets West,” a pairing of work with her San Francisco and Russia bands; and “Blue Monday Party,” a live recording at Yoshi’s. Her upcoming CD featuring Houston Person and Tammy Hall, recorded live at Jazz at Pearl’s, honors the legacy of Etta Jones. When Denise heard the Junius Courtney Big Band CD, she knew that this was a group she had to sing with, and Junius and company were pleased to welcome her into the family as a regular band member. 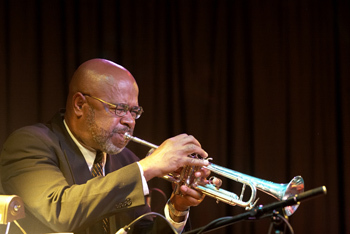 Frank Fisher, in the trumpet department, performed with the early editions of Junius’ ensembles, and is responsible for many of the band’s original up-tempo blues. Having appeared on the bandstand with John Coltrane at Jimbo’s Bop City (and on the cover of the new jazz history survey, “Harlem of the West”), Frank was recently inducted into the San Francisco Jazz Heritage’s Hall of Fame. Joining him in this honor is Terry Hilliard, bassist, who anchored Cal Tjader’s classic record “Soul Sauce” with the same depth and fleetness that he anchors the Junius Courtney Big Band today. Roberta Mandel on piano, also with Junius from the early days, drops Basie-esque punctuations, startling latin statements, and keeps the new compositions coming. 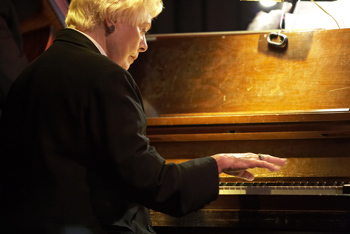 Her Strayhorn transcriptions are archived with the Smithsonian Institution. On a given night, versatile Andres Soto (lead alto) emulates Johnny Hodges on “Passion Flower” and burns within the clave on “Oye Como Va.” Building the foundation, Curtiss Mays (lead trombone) reaches into his salsa bag, then seamlessly shifts to set up the introduction to a lush “But Beautiful.” William Mitchell (lead trumpet) pulls notes, a la Cat Anderson, from the stratosphere, and the roof raises. The others in the engine room are welded to the music, teaching, performing, and working in the business of music. 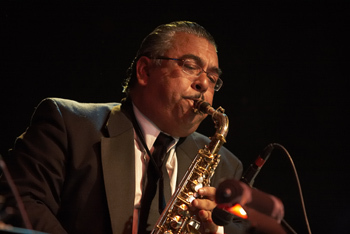 They include: James Nelson, Jerry Povse, Sam Flores and Jim Newman in the sax section. Mike Lafferty, Pat Mullan (who’s also the band manager) and Kerry Davis on trombones. Duane Worm and Paul Giorsetto in the trumpet department. Ken Husbands on guitar. Audience members have found the band to be among the best in the Bay Area.